You know that you’ve been reading too many magazines when you start using phrases like “Borrowed from the boys” or refering to the singular ‘trouser’! The “high-low mix” is another favorite fashion cliche but it does seem apt for today when I’m wearing a silk blouse, velvet blazer and sweatpants. Yes, I found a bit of sport-luxe at last. Inspired by Gina’s Baukjen (is that how you spell it??) joggers which I was about to buy until I happened upon a grey pair in H&M. I have to admit they are very comfy – this is definitely a trend I could get into! The cherry blossom silk blouse was found by Sarah last year, and I loved it so much I bought two! The velvet blazer is last winter’s Zadig and Voltaire but fortuitously is the colour of this season, and the ankle boots are fantastically comfortable by M&S. 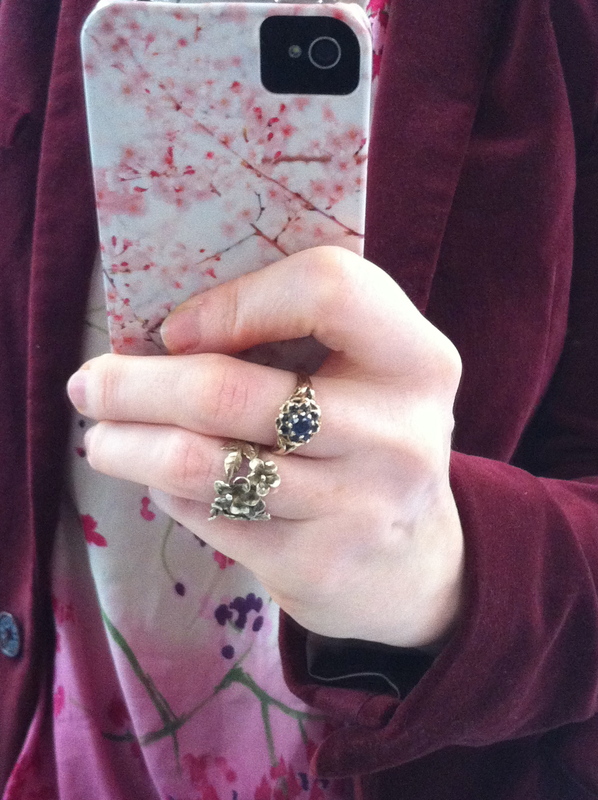 I found this floral Alex Monroe ring this morning and must wear it more often. 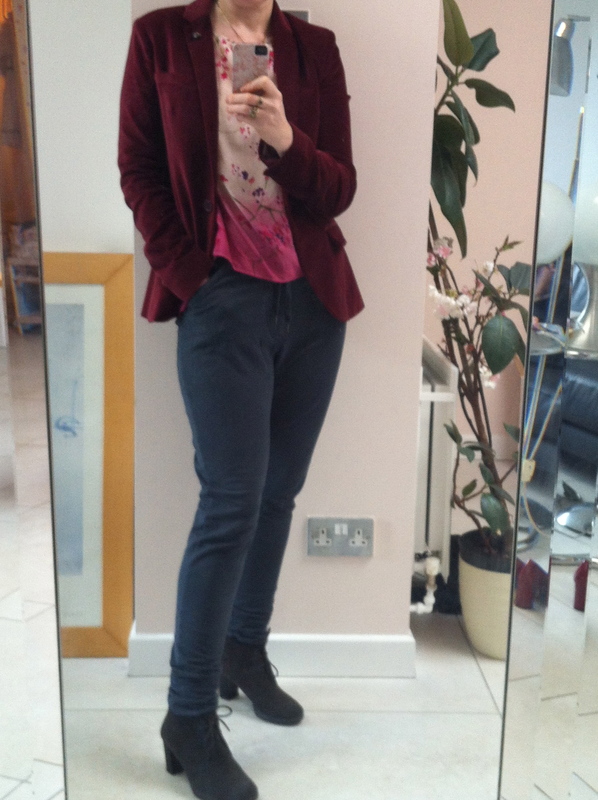 And when I saw my mums work outfit today I thought it was definitely blog-worthy! 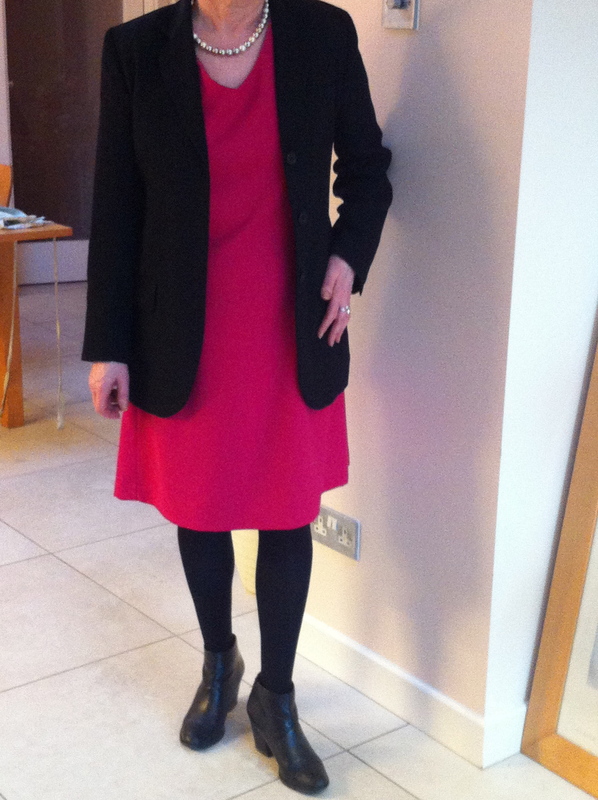 Fuchsia crepe dress she made herself, black whistles blazer and Kurt Geiger Pistol-alikes. Pretty cool for a 68 year old! This entry was posted in Outfits and tagged Alex Monroe, H&M, Kurt Geiger, Marks & Spencer, whistles, Zadig & Voltaire, Zara on September 27, 2012 by Emma WornOut.